The phrase “look what the wind blew in” rang true for a local Bakersfield man who found hundreds of tumbleweeds in his backyard. Tumbleweeds have been popularized by movies set in the Old West, but they can also end up in your own backyard on days like today when we’re expecting winds of over 30 miles per hour throughout the Valley. “It’s frustrating and it’s unhealthy to be dealing with this. I’m just dealing with it the best I can,” said Bob Jones. 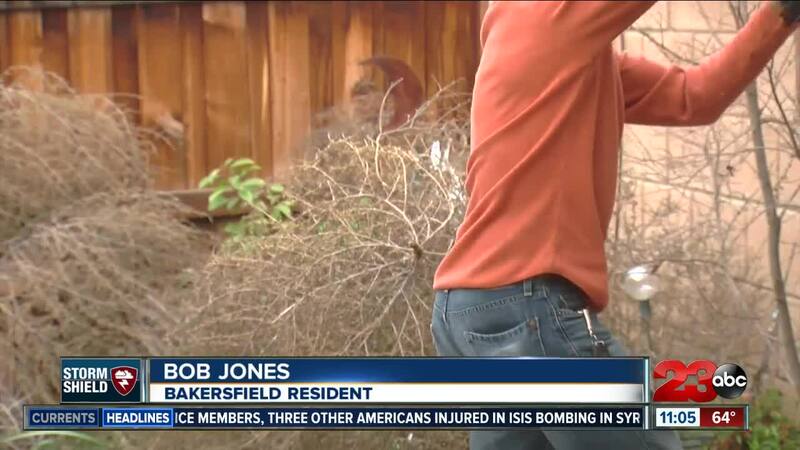 Tumbleweeds have piled up in the yard of Bob Jones and other Bakersfield residents who say they aren’t sure what to do with the prickly mess. Keith Howell, the Superintendent with the city’s Parks & Recreation says that it is the individual’s responsibility to remove tumbleweeds. However if they are blocking streets, then they become a public safety hazard and the department can remove them from public areas only. “I just hope there’s no more wind because if there is, it’ll blow right back over,” Jones said. However, more wind is coming, according to the national weather service. And the wind is to blame for the sometimes massive tumbleweeds. “We’re looking at right now about 45 to 50 miles an hour is possible,” said Jim Anderson, a meteorologist with the National Weather Service. The National Weather Service says that high winds throughout the San Joaquin Valley pull thistles from un-plowed fields, which creates tumbleweeds. “Now there again, the higher elevations will see gustier winds,” said Anderson. The National Weather Service recommends strapping down anything that may fly away as they can damage power lines and property and cause injury. The National Weather Service says to expect high winds throughout Kern County until 4 a.m. on Thursday morning.